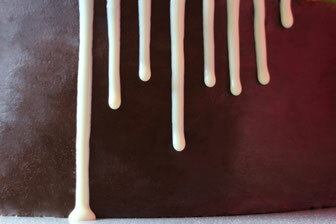 Since a long time I wanted to show you how to ganache a cake with a sharp edge on top. The cakes you see online are so beautiful but it takes quite some work and ingrediencies, so it took me a while to bake this cake and write the tutorial for you. Strawberry season is coming to an end but you can use a lot of other fruits all year round. First you make the dark chocolate ganache which you can already prepare a day in advance and heat up the next day in the microwave. I used 1,2kg dark chocolate and 400g cream which is a ratio of 3:1. You can also go for 2:1 with dark chocolate but it was a warm day and I wanted it to settle completely for the sharp edge. Heat up the cream over a water bath and take it from the stove. Soak the chocolate in the cream till it is completely melted. If it's not melting completely heat the mixture again over on the water bath till it is combined completely. Now it needs to cool down till it has a half stiff consistency which stays on your cake but you are still able to spread smoothly. Best is to let it cool overnight and heat it up in the microwave with 200W for 20sec, mix it and repeat till it has the right consistency. If the ganache has split somehow use an immersion blender till it has again a smooth finish. Befor you need the ganache for sure you need to baking the cake. 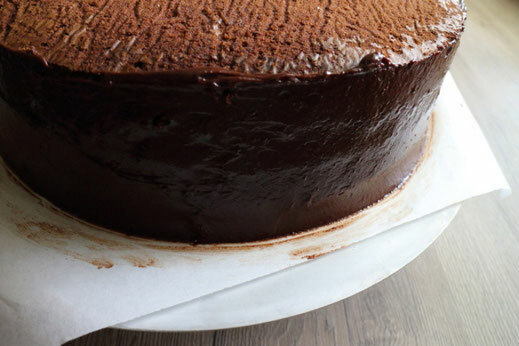 You can use my chocolate sponge cake recipe. For getting the sharp edge later on you will use a cake board so you need to adjust the size of the sponge already to the board. I used an adjustable cake ring which is perfect for this practice. Adjust the cake ring about the same size as the cake board, because the cake will shrink a little when you cut it out of the ring. If the cake later is still slightly to big you can cut away the outer edge. After it's cooled down, you can cut the cake out of the cake ring and slice it in layers. Please check now the size with the cake board. It should be about half a cm larger on both sides of the cake. If it's not sticking out that much cut away some cake before you start filling and ganaching. 1. You will use the upside down method to create your sharp edge on the cake. For this you need a flat surface e.g. a circle shaped cake lifter out of metal or any other flat cake plate without edge. Put this onto a turn table and put a baking sheet on top. To not have the cake plate moving around while you ganache the cake I put a piece of sticky mat between the turntable and the cake plate. Now put a big batch of ganache onto the baking sheet. Spread it out about 1cm thick a little bit larger than the cake. 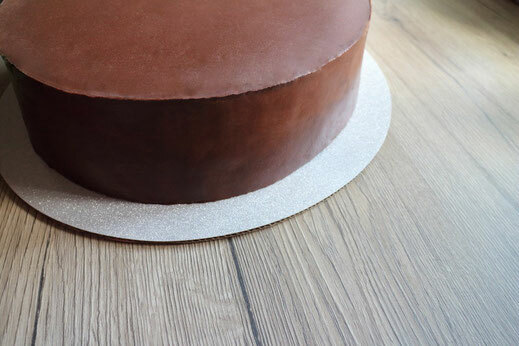 Now you can start stacking the cake and ganache layers. 2. After all layers are stacked you don't put ganache on top because that will be later on the bottom of the cake. Scrap the ganache around the cake away as good as possible and put a first layer of ganache around the cake as crumb coat. 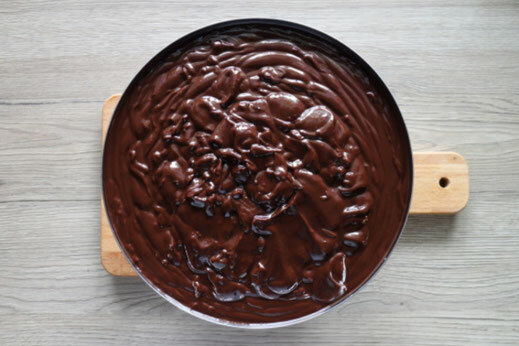 For this you can also use the ganache you just scraped away. Now it's time to put your cake board on top of the cake. I normally use a little splash of ganache to "glue it on". The cake board should now stick out slightly (about half of a cm) on each side of the cake. Use a little bubble level to make sure the cake board is straight. Now you put the cake for about 10min into your freezer to settle the crumb coat completely. 3. 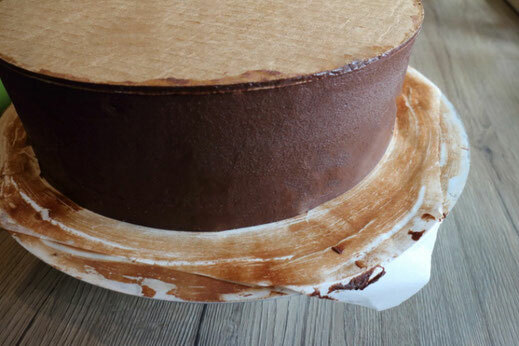 Take the cake out of the freezer and put the final finish of ganache on it. You might need to heat up the ganache again in the microwave if it already cooled down too much. Put the ganache on the side walls of the cake and use a scraper with a 90° edge to take of excess till you get a complete flat surface. Make sure you hold the scraper completely straight. Lean it on the bottom on the cake plate and on top on the cake board. If it does not work out the first time you can always put again some ganache on and take it off again with the scraper. After you got the desired finish you freeze the cake again for 10min. 4. Use a sharp knife to take of the cake board. Better to use the knife on different sides of the cake as to just push it in on one side and rip accidentally of some of the icing which sticks to the cake board. Now you put a decorative cake board or the final cake plate you want the cake to sit on on top of the cake and check again with the bubble level if it is straight. Now it's time to flip the cake. Put one hand on the top cake board and flip the cake around. Now you should be able to take off the turntable, sticky mat and cake plate. The last step is to carefully peal of the baking paper and voila you got your sharp edge on the ganached cake. For decorating the cake prepare some white chocolate ganache with a ratio of 2:1 white chocolate and cream (later on I found out 3:1 with a temperature of 50°C is perfect). 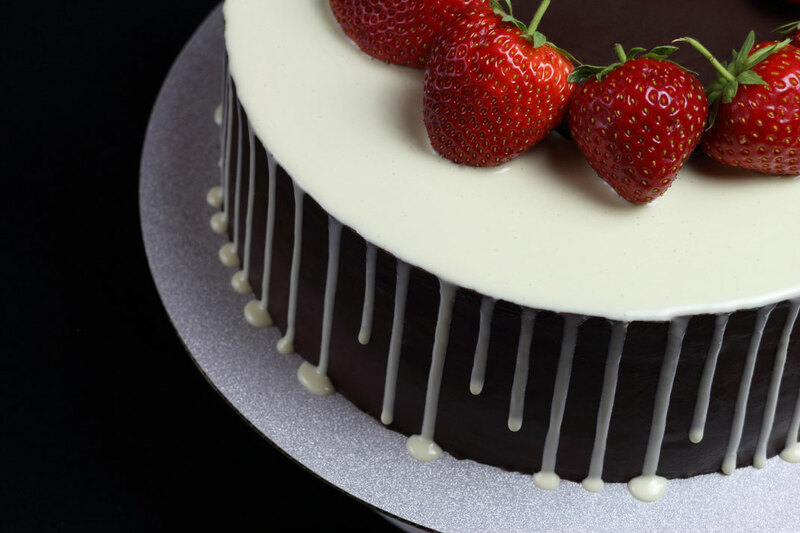 It depends on your chocolate how much cream you need to add but do a trial on the corner of a plastic box or something similar before you start decorating your cake. The white chocolate should be of a honey like consistency when you take it of the stove. Fill it into a squeezer bottle and make your trial run. 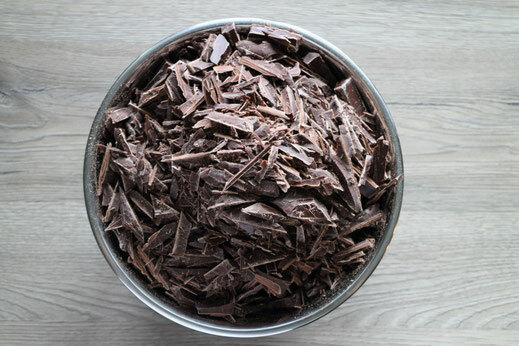 The chocolate should stop running at some point on the vertical surface. Now you can start to decorate the cake. 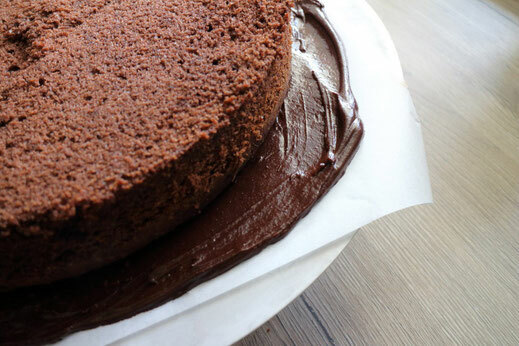 Squeeze out some ganache right on the edge and let it run half way down the cake. Move the bottle forward half a cm along the edge and do the second squeeze either a little longer or shorter so your drips have different length's. 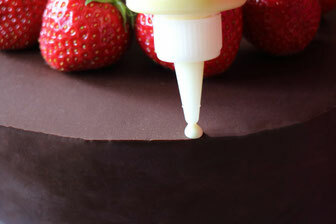 Do this 5-6 times before you go back to the first drip and fill the top surface of the cake about 3-4cm inwards. 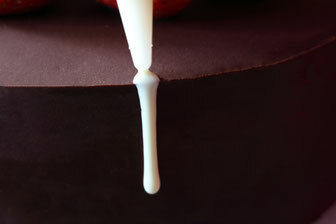 I always did 5-6 drips, let them solidify slightly till I fill the top area to not have excessive ganache run over the edge but still get a smooth finish on top. This you repeat till you are all around the cake. Last step is to place the strawberries on the cake. I did it actually the other way around, placed the strawberries first and intended to flood the areas below but realized it's easier to just add them in the end. 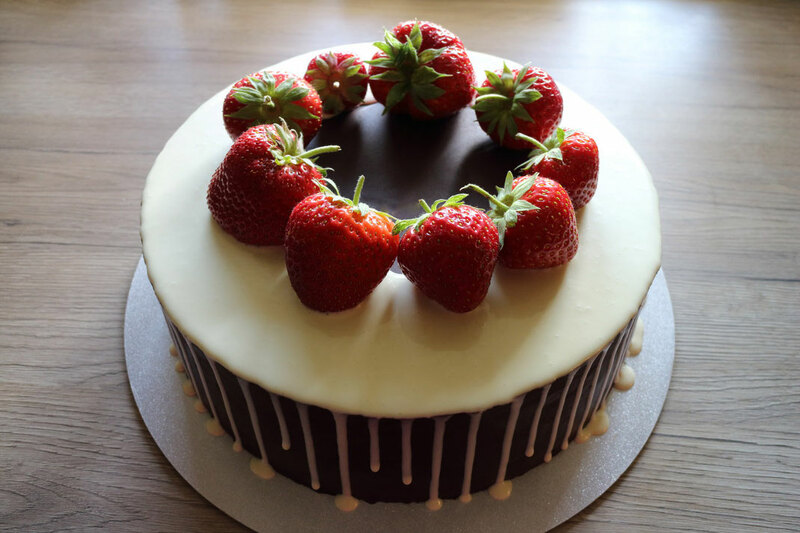 Thats how you make a strawberry drip cake. You're taking this passion to a hole new level, making it 100% professional. Congratulations!